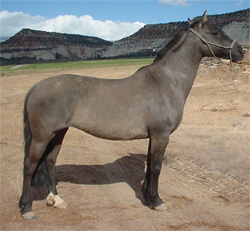 This mare is from one of the finest families of Chile. Her dam Ronquerita was Champion of Chile in 1983, her grand dam is a full sister the the great sire Roncador, her great grand dam is a sibling to Alcatraz II, the excellent sire Regador and the outstanding mare Rigurosa who was responsible for Rigor, Ñipan and Recacha. This maternal line starts with Esta Si's fourth dam, Reñaca, who is considered a "blue hen" of the breed after showing her worth in Criadero Curiche which was owned by the elite breeder Estanislao Anguita. 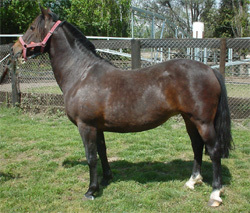 Esta Si was sent in foal to Recuerdo a second runner up in the Classifying rodeo for the Champion of Chile. Farolero is by Esperado an excellent halter horse that is by the great Estribillo and out Que Luna who produced two Champion of Chile winners in Talento and Batuco. 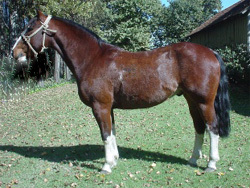 Produced by one of the leading Chilean Horse breeding farms of all times, this gelding has the looks and the breeding to respresent the breed well. This pretty mare was an interesting acquisition due to the fact she is inbred 2X2 to the excellent rodeo horse and sire Ajiaco. Ajiaco is a son of Andrajo who is from one of the strongest branches of the Africano line that is still carrying on this lineage today. This mare proved her worth both in the half-moon arenas and in local rienda competition. She is the dam of an excellent filly by Contulmo that has already made her presence felt in halter competitions. 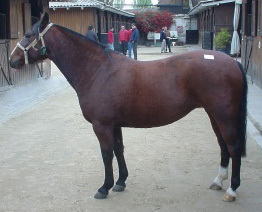 Fiesta Linda was sent to USA in foal to Romeral. Considered one of the best rodeo horses in his region and a multiple Best Breed Type winner, Romeral is by the much sought after, Rotoso. Her sire Perico is by an son of Estribillo and out of the great rodeo mare Perica who in turn is a daughter of the "blue hen" Clementina. Pretenciosa's dam is by Contubernio en Domingo who many feel was the most talented son of the great sire Nunca en Domingo. What is unquestionable is the fact he is the best bred son of Nunca en Domingo as his dam is the outstanding mare Codicia. Pretenciosa was campaigned by the excellent rider Jose Astaburuaga and she not only showed ability in rodeo but also won the only time she competed in rienda. A beautiful mare that was sent to the states in foal to the versatile winner in prestigious rodeo, rienda and halter competitions, El Cato. This handsome son of one of the hardest hitting "corraleros" to compete in the Chile rodeo, Remezon, has a great deal of promise at stud. His sire is a son of the revered Rotoso who is almost single handedly carrying on the lineage of the foundation sire Angamos I. Rotoso has proven a sire- of- sires and Remezon has his first generations starting to compete in the half-moon arenas. Recuerdo's dam is by the dual Champion of Chile winner Papayero who was purchased for a substantial sum of money and exported to Brazil. This mare is by a son of the immortal chef d' race Taco, a horse that has proven time and again that he is a successful sire- of- sires. Taconeo also carried the genes of the famed Estribillo on his maternal side. Relinda's dam is by great Picaporte. Picaporte and his sire Picurrio were unusual representatives of the Guante I line in that they were gorgeous and well structured stallions, yet they had the gifted performance abilities that are so common in this family. 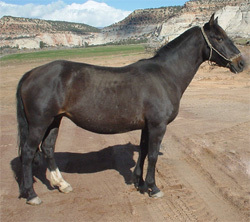 Relinda is an unusually large mare for the breed although well within the breed standard and thus should offer some very commercial offspring in the USA. She left for the Northern Hemisphere in foal to the regional champion Cristobal who is a multible winner of Best Breed Type awards. Interestingly, Cristobal is by Morcacho one of the best looking sons of Picaporte, so Relinda was carrying a foal that was inbred 3X3 to the great Picaporte. 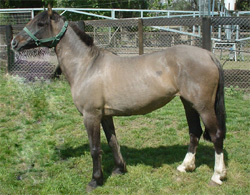 This beautiful young mare was in training for the Chilean Rodeo when she was purchased at auction. 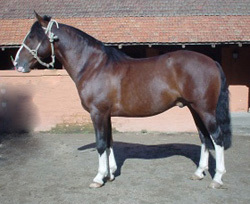 Her sire is the main stallion at one of Chile's largest breeding farms, Lo Miranda. Coraje is linebred to the Africano foundation line and he is proving to be a stallion that not only gets good performance horses but also stamps his get with a great body and much breed type. Tentaita's dam is the well remembered Clarinada. A daughter of the infamous Taco, she reached the finals of the Champion of Chile on two occasions. This mare should be full of cow working ability and with her excellent pedigree she should be able to transmit this ability as a broodmare.